Obituary – Wells, Mildred M. (Hughes) « Perry High School Alumni Association, Inc.
Normal Training, French Club, Triangle Club. Mildred M. Wells, 95, died on August 19, 2000, in Abilene, Texas. Born on February 5, 1905, in the Oak Dale township of Noble County, Oklahoma, she was the daughter of Benjamin and Nancy (Nannie) Elizabeth (Keele) Hughes. 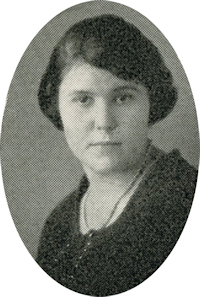 Mrs. Wells was a 1923 graduate of Perry High School and was married to Orville Wells on June 5, 1924. They made their home for a time on her father’s farm north of Perry before moving to Ponca City, Oklahoma, where Orville worked as an accountant for a petroleum refining company and Mildred worked as a relief telephone operator. They are the parents of two daughters, Juanita and Elizabeth. In addition to living in Perry and Ponca City, Orville and Mildred made their home in Oklahoma City before moving to Abilene. Orville passed away in Abilene, Texas in 1994. They are buried at Elmwood Memorial Park in Abilene Texas. Note: Memorial page was compiled by Cheryl DeJager from information available.